Duns travelled to Wilton Lodge Park, Hawick for an early kick off against Harlequins, the match doubling up as an East 1 League fixture and BT Borders Shield semi-final. 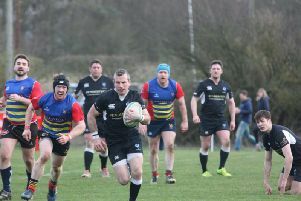 The occasion was also a notable one for the Thomson brothers – James made his debut in Duns First XV colours and was joined on the park by siblings Stuart and Michael. Sam Tullie also made his first appearance for the club and joined his brother Angus in the side. On an overcast day with little wind, Duns started badly, their kick off failed to go 10 metres and within a minute had given away three points when they were penalised for offside. Quins had the chance to add another three points after five minutes but the home stand-off failed with the penalty attempt. After little possession and conceding too many penalties in the opening 15 minutes, the visitors eventually came into the game and should have scored but for a handling error on the Quins line. After 20 minutes however, a penalty five metres out was quickly taken by captain Robert Grigg and he was pushed over to score near the posts, with Lewis Craik adding the extras. The same player kicked a fine penalty five minutes later and Duns were were in control for the remainder of the first half. The Dingers should have perhaps scored more points in this period but did score a fine try through Callum Redden following up on Stuart Thomson’s kick ahead. Craik continued his kicking form with a good conversion from wide out. The half closed with Duns 17-3 in the lead. With league points and a place in the Border Shield final at stake, a Hawick backlash was expected, and within five minutes they scored under the posts and the conversion brought them to within one score and gave hope to the home team and their supporters. Duns offered little in attack and perhaps should have played more rugby in the opposition half. The visitors were finding it hard to keep hold of the ball, and following another turnover Quins countered and their left wing scored in the corner, their kicker failed to tie the scores with the conversion. The visitors made some changes – Angus Tullie left the field with a head knock and was replaced by Michael Thomson, Richard Hume was replaced by Sam Tullie. Ewan Fleming was also injured and Dale Robertson entered the fray, the first time on the pitch where he broke his leg at the start of the 2014 campaign. Craik moved to play No 10 and Stuart Thomson filled in at centre to accommodate Robertson at full-back. With the game entering the final quarter, Quins took the lead with another unconverted try, but parity was gained with another successful Craik penalty. The clock was steadily running down and with less than five minutes remaining Hawick delivered the sucker punch with a fine try. A kick into the Duns 22 was claimed by a Quins player who leapt highest to knock the ball down into his winger’s hands to score and secured a league bonus point. The conversion was good to put Quins seven points in the lead and the home side held out to win 27-20. A losing bonus point was the only reward for the visitors. Duns: D. Turnbull, Chisholm, Smith, A. Tullie, S. Turnbull, Hume, Walker, Grigg (captain), Perrin, Fleming, Redden, Craik, Alexander, J. Thomson, S. Thomson Replacements: M. Thomson, S. Tullie, Robertson.